discover ways to reduce back pain when it occurs. In chapter 1 of the YMCA Healthy Back Book, you'll learn the warning signs indicating that you need to see a doctor. You'll also learn some common sense first aid tips for treating back pain. Chapter 2 guides you in choosing a practitioner to address your back problems and describes several of the treatment options that are available. How-to exercise book for anyone with low back pain. 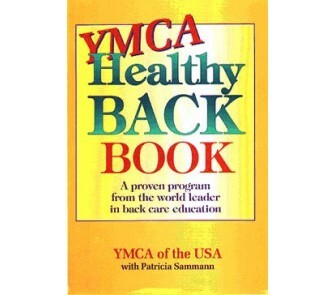 "The YMCA Healthy Back Book is a must for the millions of Americans who suffer back pain." "The YMCA Healthy Back Book offers practical information and helpful exercises that will contribute to a healthy lifestyle and a strong back." "An excellent resource which, if followed, should help prevent future problems. The book is brief, easy to read, and easy to apply to one's daily activities." "This book belongs in the libraries of all health promotion professionals and should be recommended to any individual concerned with maintaining a healthy lifestyle."